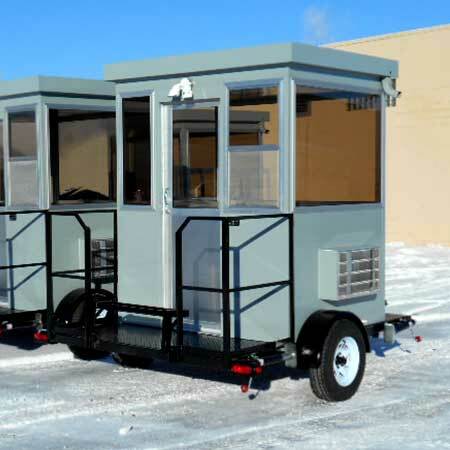 Trailer Mounted Guard Booth| Guard Booth on Trailer | Trailer Mounted Guard House Bullet Resisting | Bullet Resistant Guardhouse with Trailer| Guard Shack on Trailer. 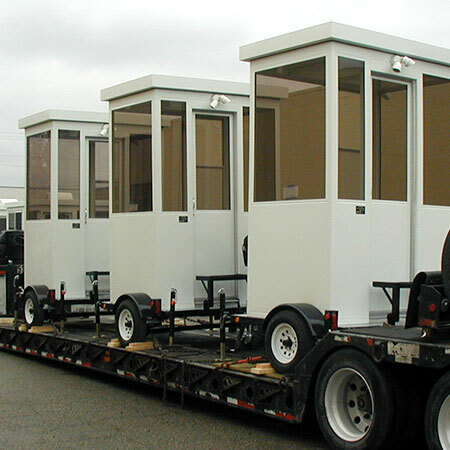 Trailer mounted guard booths and Trailer Mounted Guard House from Little Buildings, Inc. are available in a range of sizes starting with 3'x4' up to 8'x20'. 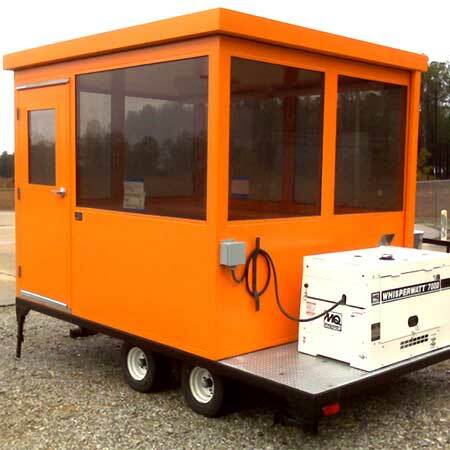 Bullet resisting trailer mounted guardhouses afford protection against specific ratings of projectiles as listed in Underwriters Laboratories (UL) table UL 752. For a list of the available UL bullet resisting levels, please contact us. 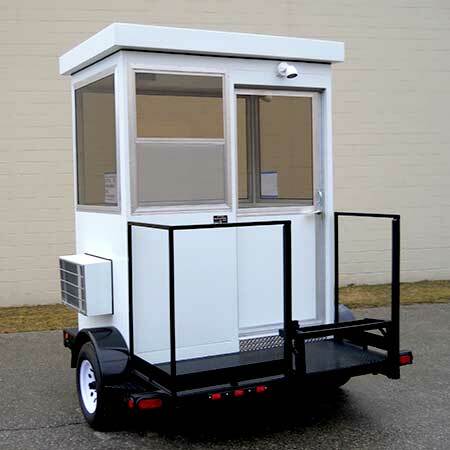 Called Trailer mounted guard booth or trailer mounted guard shack, trailer mounted bullet proof guardhouse, guard house with trailer, portable guard house or portable bullet resistant guard house, your best bet is a product from Little Buildings, Inc. Trailer mounted guardhouses and guard shack with trailer include heavy-duty trailer with corner stands, tongue jack, running lights, properly sized axle(s) and tires, and wiring coupler. Optional spare tire. Add gas or diesel generator with 25' extension cord to your guard house on trailer for truly remote locations. Models normally include a small porch with railings, swing down step with grip-strut runner, and 2" ball hitch. Pintle hitches available. Our no-nonsense approach to manufacturing, complete with multiple stage inspection points and quality materials assure that you get the Best Little Buildings on the planet! To receive additional information on our guard booth on trailer, please email us by clicking HERE or call one of our representatives toll-free at 1-888-55-BOOTH (1-888-552-6684). Note: Standard trailer mounted guard houses or trailer mounted guard booth are NOT bullet resisting, this is an optional feature at additional cost. Single axle trailers have a maximum speed limit of 25 MPH and cannot not be used at higher speeds. Do not occupy while unit is in motion.